The new terrors of the First World War also encompassed gas. The initial major attack was launched on the Eastern Front by the Germans in January 1915, then on the Western Front at Ypres three months later against French colonial troops. British propaganda poster warning about the danger of gas, 1915, sold for £375 at the Antikbar auction. 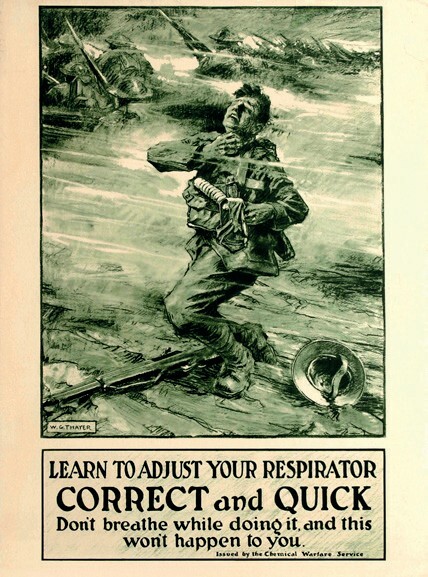 This British propaganda poster, above– Learn to adjust your respirator Correct and Quick Don’t breathe while doing it, and this won’t happen to you – was published by the Chemical Warfare Service to instruct soldiers on the importance of using their gas masks correctly. British Expeditionary Force commander Sir John French called the use of gas “a cynical and barbarous disregard of the well-known usages of civilised war”. However, just four months later British forces used gas to attack the German trenches at the Battle of Loos. Featuring artwork by Lieutenant WG Thayer, this 1915 design, 2ft 6in x 22in (76 x 56cm), tipped over top estimate to sell for £375 at the November 10 auction held by west London poster specialist Antikbar (20% buyer’s premium). The sale featured a sizeable selection of propaganda posters from both world wars, including about 60 from the first.